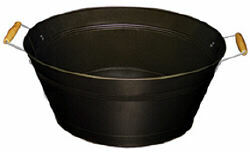 This beverage tub features an attractive and easy-to-clean antique bronze finish. Convenient wood handles make trasportation a snap. Perfect for parties and catering.